First Baptist Church of Holt, Florida Morning Service 8 December 2013 Message “Elizabeth’s Christmas Confession” Luke 1:39-45 By Pastor Curt Rainey. Pastor Arthur Elliott Co-Pastor Bibbie Elliott. Founded in 1689, the Immanuel Episcopal Church on the Green in New Castle (DE) is one of the oldest Episcopal parishes in the U.S. Immanuel’s parishioners have been worshiping on the spot where the church stands for over 300 years. Immanuel Church was the first parish of the Church of England in Delaware (then still part of Pennsylvania). Work on a church building began in 1703, and was mostly completed by 1708. 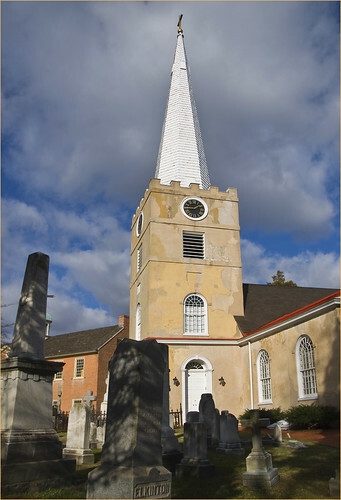 The church is located at Strand and Harmony Streets in the heart of Old New Castle, a village of well preserved colonial and federal homes and public buildings. A stroll through New Castle reveals the original capital of Delaware, the site where William Penn landed in America, as well as beautiful 17th, 18th and 19th century buildings – all within a 7-block walk of the Delaware River. As the colonial capital, New Castle grew in size and stature. Larger houses were constructed, and businesses sprang up to accommodate the judges, lawyers, and other professionals who had business in the capital. As the Revolution drew near, political debates and protests in the colony were centered in New Castle. Several signers of the Declaration of Independence lived in New Castle – one of them, George Read, is buried in the Immanuel cemetery. 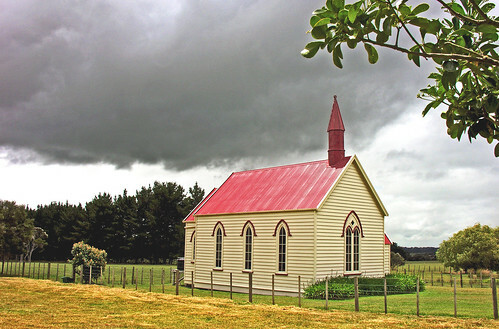 This church was built in 1875 and is a typical example of rural New Zealand churches of its era. It is still in use and beautifully preserved and maintained outside and in. This part of the North Island was originally settled by Europeans who purchased the land from local Maori and opened up large sheep runs. This was achieved peacefully because the local iwi believed that European settlement would offer them protections against the aggressions of the Taranaki tribes, and because some important tribal chiefs were converted to Christianity by William Colenso. This church was built as a chapel for a single farm and its workers. That is why it is not in a village. This history reminds me of many estate churches in England – for example that at Parham in West Sussex where my son got married. We couldn’t get inside because it was locked, but the interior woodwork is a must for a return visit! 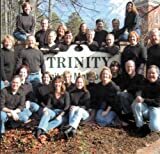 Live performance recording from the Trinity Praise Team from Trinity United Methodist Church in Richmond, VA This concert includes a piece written and performed by Kevin Burton in tribute to his sister, Alysia Burton Basmajian, who died in the World Trade Center on 9/11/01. Revered as the Prophet of the Restoration, Joseph Smith is a man who has changed the history of the world. From humble beginnings, as a farm hand in up-state New York, to Mayor of Nauvoo to First Prophet of The Church of Jesus Christ of Latter-day Saints, he bore a resounding witness of God the Father and Jesus Christ. This solid resin statue is coated in bronze enamel and stands 6.5 inches tall.